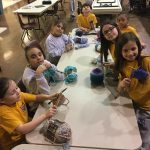 Our little knitters club is finally starting to see the fruits of their labor! For the past few weeks, a group of dedicated 2nd and 3rd graders have been working hard during their recess time on Mondays and Thursdays with Miss Lawrence. They’ve learned the basic knit stitch while working on a small project. Each student completed one small knitted patch which will get sewn together to make a cute pillow the students plan to give away as a gift. 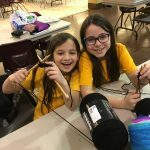 Some students have even moved onto a new project – making a headband – which will include the new skill of working with multiple strands of yarn to create different color blocks and stripes. 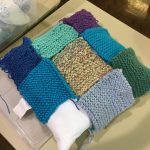 The yarn for our pillow project was provided by each of the students. Most of the yarn for our headband project was donated to our group by a friend of Miss Lawrence. The students have been learning a crafty life skill and have also shared a lot of laughs and fun times along the way.